Advocate staff photo by MATTHEW HINTON--Deacon John Moore sings with Rock and Roll Hall of Fame inductee Allen Toussaint during the "A Tribute to Toussaint" at Harrah's Casino on April 30, 2013. The concert benefited New Orleans Artists Against Hunger and Homelessness (NOAAHH), which Toussaint helped found. Advocate staff photo by MATTHEW HINTON--Rock and Roll Hall of Fame inductee Elvis Costello sings with fellow Hall Inductee Allen Toussaint during the "A Tribute to Toussaint" at Harrah's Casino on April 30, 2013. 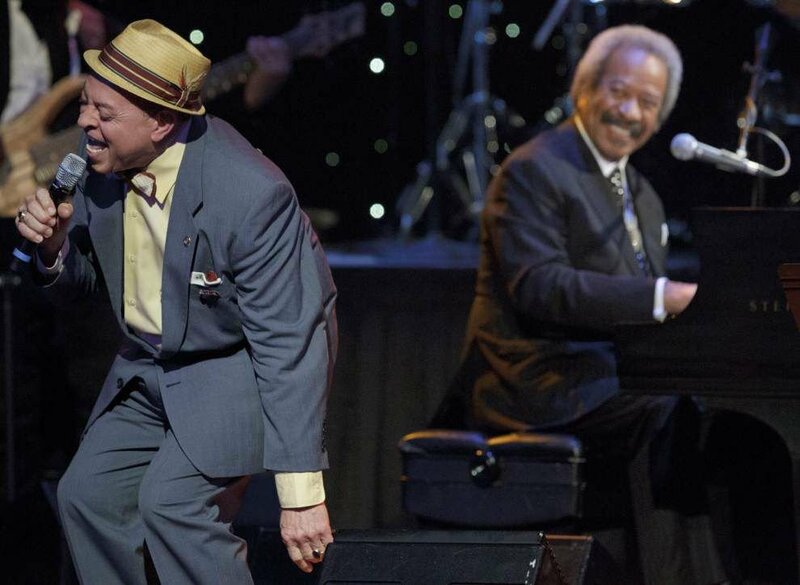 Advocate staff photo by MATTHEW HINTON -- Deacon John Moore sings with Rock and Roll Hall of Fame inductee Allen Toussaint during the 'A Tribute to Toussaint' at Harrah's Casino. Moore will perform gospel music at the Healing Center. Advocate staff photo by MATTHEW HINTON-- Allen Toussaint performs on the Acura Stage on the second Saturday of Jazz Fest 2014 in New Orleans, La. Saturday, May 3, 2014. Advocate staff photo by MATTHEW HINTON-- Jimmy Buffett joins Allen Toussaint on the Acura Stage on the second Saturday of Jazz Fest 2014 in New Orleans, La. Saturday, May 3, 2014. Advocate staff photo by MATTHEW HINTON-- Rock n Roll Hall of Fame inductee Allen Toussaint and entertainer Chris Owens pay their respects at the display of Mickey Easterling at the Saenger Theatre in New Orleans, La. Tuesday, April 22, 2014. After passing away April 14, Mickey Easterling, a New Orleans socialite known as much for her grand lifestyle and outlandish hats as for her civic, cultural and political activism, sits on a bench surrounded by flowers and some of her other favorite things. Her family declined to release her age, noting she once said, Age is a number, and mines unlisted. Easterling, born Marycathyren Gambino, hosted many charity and political fundraisers at her home, welcoming such guests as singers Paul Simon and Robert Goulet, actor Larry Hagman, writer and composer Paul Bowles and a range of political figures including former Gov. Edwin Edwards and retired Gen. Wesley Clark. Advocate staff photo by MATTHEW HINTON-- Rock n Roll Hall of Fame inductee Allen Toussaint pays his respects at the display of Mickey Easterling at the Saenger Theatre in New Orleans, La. Tuesday, April 22, 2014. After passing away April 14, Mickey Easterling, a New Orleans socialite known as much for her grand lifestyle and outlandish hats as for her civic, cultural and political activism, sits on a bench surrounded by flowers and some of her other favorite things. Her family declined to release her age, noting she once said, ÒAge is a number, and mineÕs unlisted.Ó Easterling, born Marycathyren Gambino, hosted many charity and political fundraisers at her home, welcoming such guests as singers Paul Simon and Robert Goulet, actor Larry Hagman, writer and composer Paul Bowles and a range of political figures including former Gov. Edwin Edwards and retired Gen. Wesley Clark. Advocate staff photo by JOHN McCUSKER -- The line up and poster for the 2015 French Quarter Festival was unveiled Thursday, February 5, 2015 at Jackson Square. Allen Toussaint and Charmaine Neville were on hand for the event. Toussaint will perform at the festival for the first time in over a decade. Neville performed with her band at the announcement. Advocate staff photo by MATTHEW HINTON--Flowers have been placed at the feet of a statue of Allen Toussaint in New Orleans Musical Legends Park on Bourbon Street in New Orleans, La. Tuesday, Nov. 10, 2015. Toussaint died will on tour in Spain at age 77 on Monday. Advocate staff photo by MATTHEW HINTON--Rock and Roll Hall of Fame inductee Allen Toussaint waves to the crowd during "A Tribute to Toussaint" at Harrah's Casino on April 30, 2013. Playing drums is Toussaint's son-in-law, Herman LeBeaux. The concert benefitted New Orleans Artists Against Hunger and Homelessness, which Toussaint helped found. Advocate staff photo by MATTHEW HINTON--To empty chairs are seen outside the Mother-In-Law Lounge that has a mural depicting Allen Toussaint playing the titular song with Ernie K-Doe in New Orleans, La. Tuesday, Nov. 10, 2015. Rock and Roll Hall of Fame inductee Toussaint died will on tour in Spain at age 77 on Monday. Advocate staff photo by MATTHEW HINTON--The childhood home of Allen Toussaint in Gert Town is seen in New Orleans, La. Tuesday, Nov. 10, 2015. Toussaint died will on tour in Spain at age 77 on Monday. Advocate staff photo by MATTHEW HINTON--Tourist Yuichi Fukaya of Japan looks at the flowers that have been placed at the feet of a statue of Allen Toussaint in New Orleans Musical Legends Park on Bourbon Street in New Orleans, La. Tuesday, Nov. 10, 2015. Toussaint died will on tour in Spain at age 77 on Monday. Advocate staff photo by MATTHEW HINTON--Allen Toussaint, left, blows out candles on a 75th anniversary piano cake while Elvis Costello, in pink hat, and others celebrate with him at Harrah's Hotel in New Orleans on April 30, 2013. The party followed the "Tribute to Toussaint" concert, which honored the Rock and Roll Hall of Famer's career and 75th birthday. Advocate staff photo by MATTHEW HINTON--Tourist Yuichi Fukaya, left, of Japan, looks at the flowers that have been placed at the feet of a statue of Allen Toussaint in New Orleans Musical Legends Park on Bourbon Street in New Orleans, La. Tuesday, Nov. 10, 2015. Toussaint died will on tour in Spain at age 77 on Monday. Advocate staff photo by MATTHEW HINTON--Jessica Singletary ministry assistant for Edgewater Baptist Church spells out a sign in support of the family of Rock and Roll Hall of Fame inductee Allen Toussaint near his home in New Orleans, La. Tuesday, Nov. 10, 2015. Toussaint died will on tour in Spain at 77 Monday. 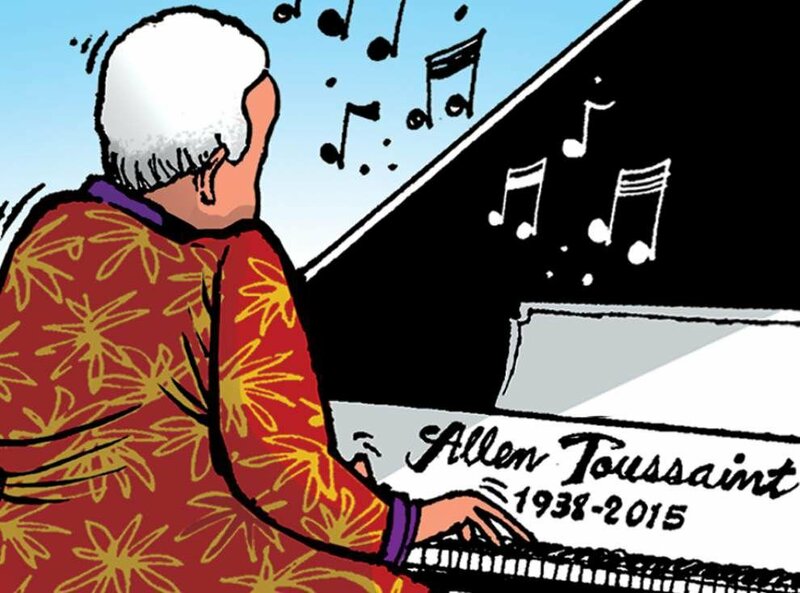 Allen Toussaint, the gentlemanly Rock and Roll Hall of Fame songwriter, producer, pianist and singer whose prolific, multiple-decades career cast him as the Renaissance man of New Orleans music, died of an apparent heart attack following a concert Monday night in Madrid. He was 77. As a young man, Toussaint was the golden boy of the golden age of New Orleans rhythm and blues, writing and producing signature songs for multiple artists. His hundreds of credits include Ernie K-Doe’s “Mother-in-Law” and “A Certain Girl,” Irma Thomas’ “It’s Raining” and “Ruler of My Heart,” Benny Spellman’s “Lipstick Traces” and “Fortune Teller,” Art Neville’s “All These Things,” Lee Dorsey’s “Ride Your Pony” and Chris Kenner’s “I Like It Like That,” as well as seminal recordings by Aaron Neville, the Meters and Dr. John. Performers who covered his compositions include the Rolling Stones, The Who, Bonnie Raitt, Boz Scaggs and Phish, among many others. In the years since his acclaimed post-Hurricane Katrina collaboration with fellow songwriter Elvis Costello, Toussaint enjoyed a late-career resurgence as a touring artist. In his songwriting and conversations, Toussaint could craft a turn of phrase with an elegance and economy that rendered it indelible. A consummate professional, he conducted himself with a gracious ease that embodied the evocative imagery of his original, wistful version of “Southern Nights,” which Glen Campbell later turned into a pop-country smash. He was a familiar sight at functions and benefits around town. He had been slated to play a Dec. 8 benefit concert with Paul Simon for New Orleans Artists Against Hunger and Homelessness at Le Petit Theatre du Vieux Carre. Toussaint was born in 1938. He grew up in the Gert Town neighborhood as the youngest of three children. He taught himself to play the family’s upright piano, influenced heavily by the syncopated style of New Orleans legend Professor Longhair and Ray Charles, whom he heard on the radio. Barely 13, he joined an R&B band called the Flamingos, which featured Snooks Eaglin on guitar. He recruited members of the Meters, a pioneering funk band that was working at the Bourbon Street club the Ivanhoe, to serve as Sansu’s and Sea-Saint’s house band. The Meters released a string of classic singles and albums under their own name, even as they backed Dr. John, Lee Dorsey and other acts that Toussaint produced. His reputation earned him a client roster that reached well beyond New Orleans. He produced the 1974 smash “Lady Marmalade” for the female group LaBelle. Paul McCartney and his band Wings recorded much of their 1975 album ‘’Venus and Mars” album at Sea-Saint. Robert Palmer cut much of his 1974 debut “Sneakin’ Sally Through the Alley” there. Toussaint recorded several albums of his own in the 1970s. “Working in the Coal Mine,” originally recorded by Lee Dorsey, would be covered by both the quirky New Wave band Devo and the mother-daughter country duo, the Judds. His many accolades included the National Medal of Arts, which he received from President Barack Obama during a 2013 awards ceremony at the White House. That same year, he was named an honorary doctor of fine arts by Tulane University, alongside fellow honorees Dr. John and the Dalai Lama. For most of his career, Toussaint was a reluctant performer, content in his lucrative role as the man behind the curtain. For years, he rarely performed other than at an annual evening concert aboard the riverboat President during Jazz Fest. That changed following Hurricane Katrina, which he rode out in a downtown hotel as his longtime home in the Gentilly neighborhood was inundated. With his hometown in ruins, he retreated to New York City, where he performed at several benefits for the Katrina relief effort. After sharing stages with him in New York, longtime fan Elvis Costello pitched Toussaint on the idea of a collaborative album. In late 2005, they finished what became “The River in Reverse” at Piety Street Studio in the Bywater neighborhood. Released in 2006, “The River in Reverse” kickstarted a new career for Toussaint as a touring artist. He and Costello performed around the world to promote the album, alternating songs from their respective catalogs and their joint album. Toussaint continued to be an enthusiastic performer for the rest of his life. According to Davis, Toussaint was seemingly in good health recently. In late October, he joined Irma Thomas, Buddy Guy, Buckwheat Zydeco, Tab Benoit and dozens of other artists for the Legendary Rhythm & Blues Cruise, which departed from Fort Lauderdale, Florida, for a week’s worth of shipboard performances across the Caribbean. A week later, he traveled abroad for a brief European tour with his quartet. But while onstage Monday at Madrid’s Teatro Lara, he started feeling ill and began sweating profusely. Nevertheless, Davis said, he returned to the stage for an encore of “Play Something Sweet (Brickyard Blues).” Later that night, he was discovered unresponsive at a hotel. Paramedics reportedly arrived quickly, but Toussaint was pronounced dead en route to a hospital. Indicative of Toussaint’s status in the broader world of popular music, a litany of marquee acts, from the Rolling Stones to Harry Connick Jr., expressed their condolences on social media as the news of his unexpected passing spread. Survivors include a son, Clarence “Reginald” Toussaint, who often performed as a percussionist in his father’s band; a daughter, Alison Toussaint LeBeaux, who helped manage her father’s career; and several grandchildren.